WASHINGTON (AP) — House Republicans unveiled a "discussion draft" of a sweeping immigration bill that includes a path to citizenship for young immigrants, $25 billion in border security — including advance funds for President Donald Trump's wall with Mexico — and cuts to family-based visas in favor of those for immigrants with skills. It also responds to widespread concern over the sharp rise of families being separated at the border by proposing to keep children in detention with their parents, undoing rules that limit the time minors can be held in custody. Presented to lawmakers Thursday, the measure sticks to Trump's immigration priorities while trying to join the party's warring conservative and moderate factions on an issue that has divided the GOP for years. Passage is far from certain. Speaker Paul Ryan wants to hold a vote as soon as next week to put the issue to rest before the midterm election. He called it a "very good compromise." "Our members felt very, very passionate about having votes on policies they care about, and that is what we are doing," he said earlier Thursday. "So we're bringing legislation that's been carefully crafted and negotiated to the floor. We won't guarantee passage." The 293-page bill represents the kind of ambitious overhaul of the immigration system Republicans have long considered but have been unable to turn into law. It shifts away from the U.S.' longtime preference for family immigration to a new system that prioritizes entry based on merits and skills. It beefs up border security, clamps down on illegal entries and reinforces other immigration laws. But the main new element is a path to citizenship for as many as 1.8 million young people who have been living in the U.S. illegally since childhood. Many conservatives object to providing these immigrants with legal status, calling it amnesty for those who broke the rules to get here. They are commonly referred to as "Dreamers," based on never-passed proposals in Congress called the DREAM Act that would have provided similar protections for young immigrants. Rep. Scott Perry, R-Pa., a member of the Freedom Caucus, said Thursday that he continued to have concerns. The conservative Heritage Action for America organization said it opposed both the compromise bill and a rival conservative measure that's also set for a vote next week. The group called the legislation the "codification of amnesty." Republicans were reluctant to tackle the "Dreamer" issue this year. 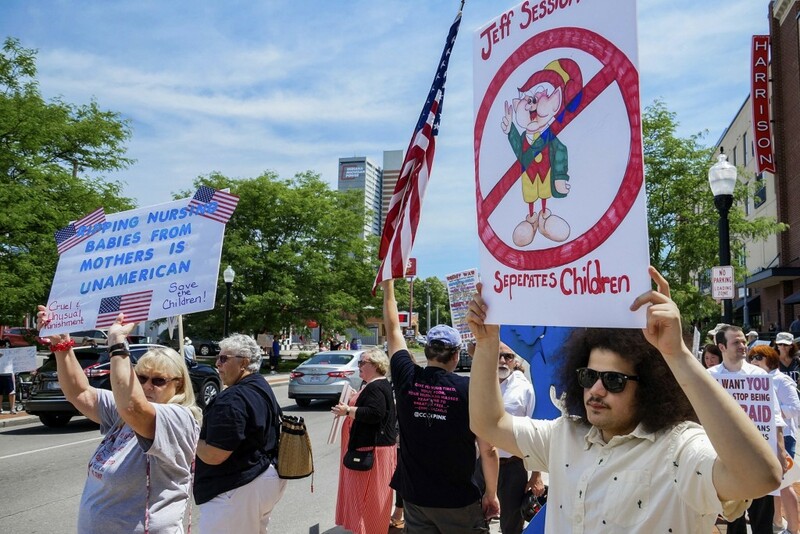 But it took on new urgency when moderate Republicans pushed it to the fore after Trump ended the Obama-era Deferred Action for Childhood Arrivals program, exposing the young immigrants to deportation. A federal court case has temporarily allowed the program to keep running. One Republican, Rep. Tom MacArthur of New Jersey, said he likes the way the compromise bill handles young people because "they're not getting in line in front of anyone else. That's fair." But, he added, because those people can eventually apply for citizenship, "they're not permanently sort of second-class residents of America." Under the proposal, some 700,000 DACA recipients, as well as a broader group of young people who didn't register for the program, could apply for legal status, which would be valid for six years and renewable "indefinitely." Eventually, young people, who are under 31 years old and have been in the country since at least June 2007, could begin to be awarded green cards based on a point system. It prioritizes education, English language proficiency, military service and continued employment. After that, they could apply for citizenship, as is the situation under current law for those with permanent legal status. The new visa program, which is also available to other immigrants — including what lawmakers said is about 200,000 children who were brought to the U.S. legally by their parents — is contingent only if the $25 billion in border security funding has been fully provided. In return, the proposal would eliminate several existing visa programs. Among them, family-related visas for the married children or adult siblings of U.S. citizens as well as the 55,000 visas now available under the diversity lottery system for immigrants from other represented countries, including many in Africa. To beef up the border, the proposal provides the $25 billion the White House wants for security, including technology, roadways and money for the border wall. It authorizes National Guard troops at the U.S.-Mexico border. It also calls for the deployment of a biometric entry-exit system for all entry ports that has long been under debate. The bill makes it easier for authorities to deport those here illegally, rather than allowing some to be released under certain circumstances. For children who arrive unaccompanied, it proposes "equal treatment" despite their country of origin, which opens the door for sending children from Central America back to their home countries the same way children from Mexico are turned back at the border. Associated Press writers Kevin Freking, Matthew Daly and Alan Fram in Washington contributed to this report.